He shouts, he taunts, he over-emotes, and he makes shots - a lot of them. Just 16 games into his SEC career, and Marshall Henderson is already the most passionate, exciting, and combustible Ole Miss player in years. The Rebels are off to a 14-2 starts, 3-0 in conference and tied atop the SEC. Henderson has 4 games with 25+ including 32 & 26 in road wins at Tennessee and Vanderbilt. But the numbers aren't as impressive as the heroics. 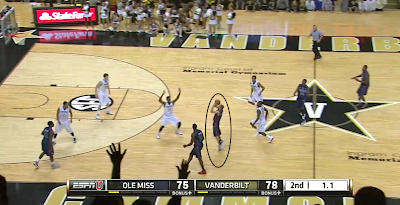 Look at the form from 37 feet away with one chance to keep his team alive at Vandy. He's got that kind of range and is deadly at the foul line. As a TV analyst pointed out the other night, Ole Miss has to always keep an eye on Henderson becoming "emotionally intoxicated." There were plenty of bumps on the road to Henderson's arrival in Oxford, where he's now a 22-year old Junior. Henderson is from Hurst, Texas, practically in the shadow of DFW. He started at Utah as a Freshman, then transferred to Texas Tech but left when Coach (Pat) Knight was dismissed. But Henderson stayed in the Lubbock area, attending South Plains College, where he was National Juco Player of the Year and led the Texans to the Junior College National Championship. 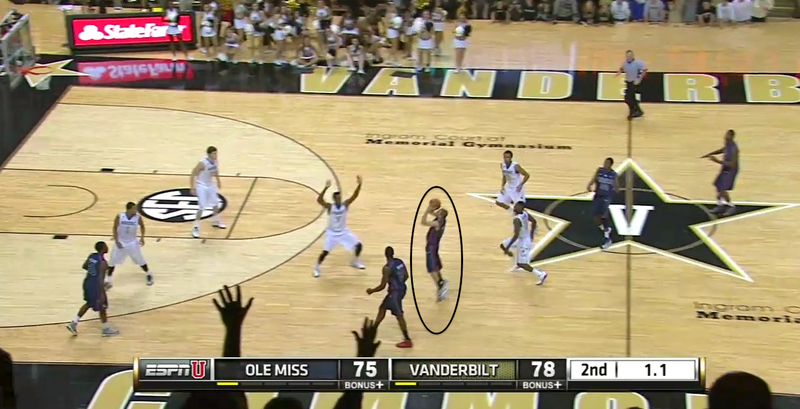 He already has the shot of the college basketball season, and has even popped up on Grantland's radar. His in-game skills and swagger are reminiscent of another Texan you may have heard of lately, Johnny Football. Hoops Henderson, anyone? Ole Miss hosts Arkansas Saturday in a surprisingly important early-season SEC game.